Patients who rely on vision aids to see near objects clearly can undergo a safe and effective treatment to reduce or eliminate their need for glasses and contact lenses. Conductive keratoplasty, performed at our Baltimore area offices, is a minimally invasive procedure that uses a controlled release of radio frequency energy to heat and reshape the cornea. This reshaping of the cornea allows light to properly focus on the retina, producing clear, unaided vision when viewing objects up close. Conductive keratoplasty can be performed on patients who have hyperopia (farsightedness) and presbyopia (age-related farsightedness). To learn more about how this treatment can change the way you look at the world, contact one of our offices to schedule an eyesight evaluation with Dr. Sonny Goel. As we get older, we begin to lose our ability to clearly see objects that are up close, often causing us to hold books and newspapers at arm's length just to be able to focus on the words. This leaves us dependent on glasses and bifocals when performing normal day-to-day activities. Age-related farsightedness is caused when the bond between the lens and surrounding muscles becomes more lax due to aging, a condition known as presbyopia. The loosening of the bond makes it difficult for patients to focus on near objects. Presbyopia typically begins to affect patients when they are in their 40s. Hyperopia, which is also known as farsightedness, occurs because the surface of the eye is too flat. The flat corneal surface causes light to focus behind the retina, rather than directly on it. Hyperopia can affect patients of all ages. 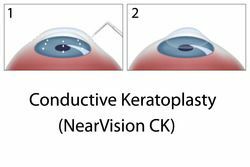 Conductive keratoplasty is not a laser vision correction procedure like LASIK surgery, but instead uses radio waves to heat and reshape the surface of the eye, thereby correcting refractive errors. To begin the treatment process, Dr. Goel will administer anesthetic eye drops to ensure your comfort during the procedure. Once the eye drops have taken effect, he will use a specially designed handheld probe that emits controlled release radio frequency energy. The heat produced from these radio waves shrinks the collagen in the targeted area on the surface of the eye, causing the cornea to steepen to the degree indicated to correct your vision. The entire conductive keratoplasty procedure is painless and only takes about three minutes for each eye. After the surgery, there is no need to cover your eyes or wear a patch. However, you should avoid getting water or makeup in your eyes for about one week, and try to avoid rubbing or touching the eyes for about two weeks. Patients typically notice dramatically improved vision immediately, and outcomes are generally very good. Patients should keep in mind that vision continues to degenerate with the aging process; this may result in the need for another procedure to correct new vision loss. If you suffer from age-related vision loss and would like to learn more about minimally invasive conductive keratoplasty, please contact one of our offices to schedule a consultation with Dr. Goel.